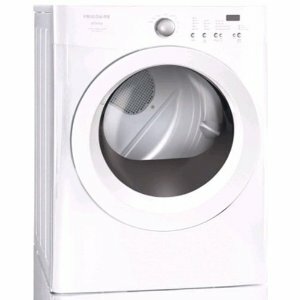 Frigidaire FAQE7011LW Affinity, Classic Electric Dryer 7.0 cu. ft. The FAQE7011LW is a model of dryers in the Affinity line of dryers produced by Frigidaire. Included mechanisms in this model are trademark Frigidaire features such as TimeWise Technology which makes the length of wash time and dry time the same, so the user will know exactly how much time the drying process will take. Another feature is the Express-Select Controls which lets users, with just one button, select cycles and options in a breeze. The Save Your Settings option also automatically remembers the last dry setting that a user used so that the time spent doing laundry is cut. The 7.0 cubic feet capacity of the dryer makes the model an Ultra-Capacity Dryer, according to its manufacturer. Loads of laundry can get dried faster, since the interior tub of the dryer can handle that much laundry, which is the largest among dryers 37 inches or less in height and 27 inches or less in width. This capacity also classifies the machine as a Fits-More Dryer, meaning the dryer has the largest capacity among standard sized dryers. The DrySense Technology included in the dryerís mechanism acts as more or less like a sensor, making the machine dry items in a more precise fashion, with wrinkles largely reduced. The dryer has achieved NSF Certification because of its 'Sanitize' temperature settings that ensures users that items dried by this machine is 99.9 percent free of bacteria. The white exterior of the model makes the unit look very sleek and clean in a classical way. The machineís neutral color makes it easy for its owners to place it in any room, as there is no color clash. The front loading orientation of the dryer makes the top portion of the dryer available for stacking, which can be occupied by the dryerís matching washer. This space can also just be additional storage space where washing or drying implements can be placed. The six drying cycles of the dryer, which include Heavy, Normal, Casual and Delicate would be sufficient for users who would like to employ different cycles for the items they would like to dry. The 4 preset Timed Dry options (90, 60, 30, 15 minutes) give users enough leeway to choose which time option would be perfect for the load to be dried. There are only 4 temperature options in this model, which means there would be limited choice in terms of added or lowered temperatures, which should have been more useful for particular delicate or heavier items. The timed dry options are set in 15 minute increments which could be limiting for users who would rather have something that would adjust time by more precise increments or decrements, for example, adding or deducting 1, 2, 3 or 4 minutes to come up with 17, 22 or 46 minutes.